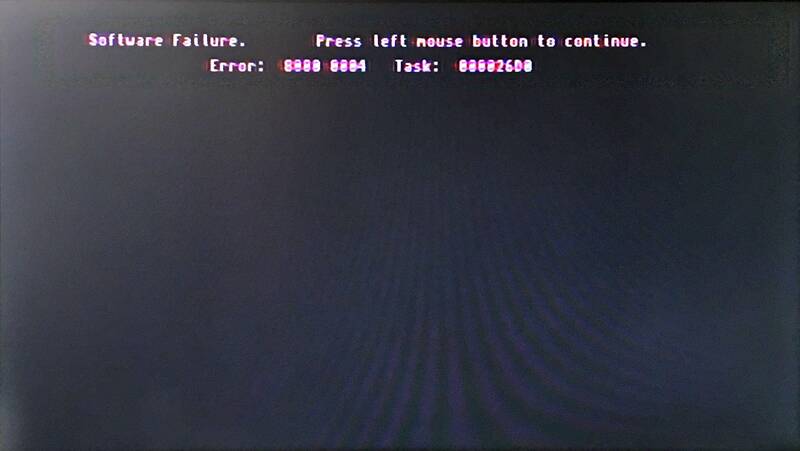 Software Failure on Commodore Amiga 600 when I insert a floppy in drive. Independent from the floppy I insert. Can't identify the error: is it a ROM error, or a floppy drive error? A virus, maybe (even if I think it's not plausible)? TL;DR: It's an illegal instruction error. Most likely you're trying to boot code for a different CPU (like an 68020 or above). Details for (early) errors are defined in the exec/alerts.h file (*1,2). 80 has the high bit set indicating a machine stoping error and 00 indicating CPU errors directly taken from the coresponding exception. The 'Task' value is just the address it happened. That may be a floppy drive defect, since it errors on all your disks. Read errors in the bootblock may cause the illegal instruction. Not the answer you're looking for? Browse other questions tagged amiga floppy-disk rom amiga-600 or ask your own question. Can a modern 1.44MB floppy drive work with an Amiga 2000?